Naval Admiral William H. McRaven is an accomplished Navy SEAL for 36 years and one of most highly respected US military leaders. 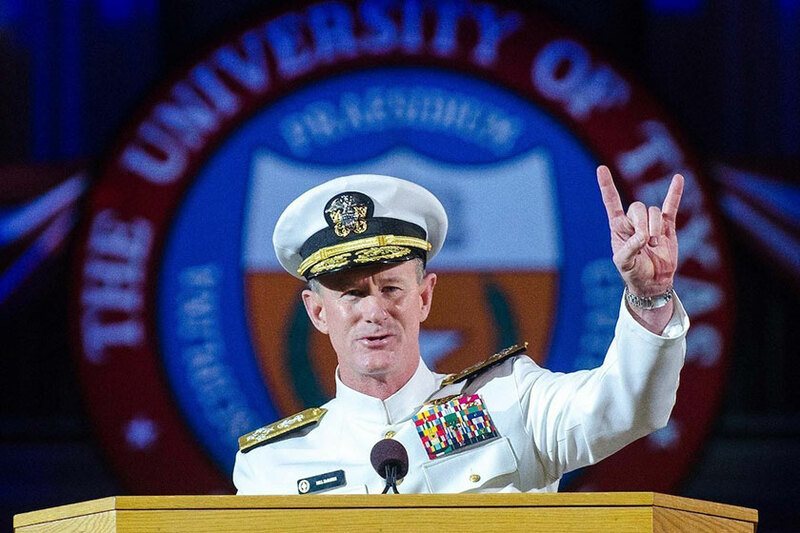 He returned to his alma mater, the University of Texas at Austin, and spoke to the graduates with lessons he learned from his basic Nay SEAL training. He delivered this amazing commencement address to thousands of students. Watch the video and please SHARE this with your friends. But, if every one of you changed the lives of just ten people—and each one of those people changed the lives of another ten people—just ten—then in five generations—125 years—the class of 2014 will have changed the lives of 800 million people. 800 million people—think about it—over twice the population of the United States. Go one more generation and you can change the entire population of the world—8 billion people. 5. But if you want to change the world, don’t be afraid of the circuses. 7. So, if you want to change the world, don’t back down from the sharks. 9. So, if you want to change the world, start singing when you’re up to your neck in mud.